Amazon India has kicked off the its much-anticipated Great Indian sale . The sale which started from 12 in the midnight will go on until October 17 where the online retailer is expected to offer some great deals across their catalogue to its customers. A wide range of offers on mobile phones, electronics, home & kitchen among others is in line during the sale. Wireless speakers have become a necessity for many lately. With competition gearing up to offer the best audio quality in a minimal package, the prices are now more competitive. Here in, we at TechRadar have scoured through the deals and brought you the best ones that you should certainly look at during the second Amazon India Great Indian sale 2018. JBL GO speakers are up for grabs at Rs 1,599 form their usual retail price of Rs 2,096. These speakers from JBL are compact and come in a really small form-factor providing great sound. It just weighs 132 grams and users can carry it anywhere with quite an ease and listen to music on-the-go. The JBL GO speakers also come in eight quirky colours which users can choose from during the Great Indian Festival sale on Amazon India. Another small and powerful offering, this time from Ultimate Ears offers 360-degree of amazing sound from its Wonderboom portable speakers. As an addition, the Wonderboom speakers are IPX7 rated which makes them waterproof for up to 30 minutes in a depth of 1 meter of water. The speakers are powered by a battery which provides a life of ten hours before the user will need to charge it. The UE Wonderboom portable speakers come in various peppy colours and during the sale customers can grab this wonder for Rs 5,399 lesser than its original price of Rs 6,199. This Roll 2 speaker might seem compact and smaller than most wireless speakers around but boy do they sound awesome. The Ultimate Ears Roll 2 wireless speaker system is IPX7 rated which makes it waterproof for up to 1 meter in water for 30 minutes. For music on-the-go, the Roll 2 speaker is pretty much our go-to recommendation. The UE Roll 2 can be bought for Rs 3,499 down from its usual retail price of Rs 8,495 during the sale. 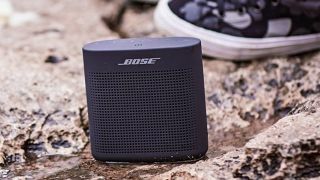 This tiny wireless Bluetooth speaker is IPX5 rated which makes it waterproof as well as shockproof making it a really great device to have by your side when travelling outdoors. The exterior of this little beast is constructed out of silicone, rubber with a matte finish. You can get it right now during Amazon Great Indian sale for Rs 1,399 down from its original price of Rs 2,490. This wireless streaming music device comes with Bluetooth connectivity and has an in-build rechargeable battery which can lasts up to 5-6 hours with moderate volume. It also has a special feature called Anti-Clipping which allow the users to play music louder even at low battery. Amazon is offering the speaker at a discount of 35 percent. The 2.1 channel multimedia speakers offers good sound quality with powerful bass by its 2.5" full range driver for satellites and a 4" bass driver for the subwoofer. It also has USB, Bluetooth and FM storage of up to 100 radio stations. You can buy the speakers at Rs 1,899 after a discount of 27 percent. The Boat Stone 200 portable speaker is a rugged, waterproof Bluetooth speaker. Despite of its small form factor, it produces tight bass with a balanced and mellow high pitched tones. It supports most of the Bluetooth enabled devices and offers up to 8 hours of wireless play. Amazon is retailing the speaker at Rs 1,199. This Bluetooth enabled portable speaker has a unique and aesthetic design. It is compatible with both iOS and Android devices. You can also transfer your favorite songs and audio recordings via USB port. You can buy the speaker at Rs 1,899 after a discount of 46 percent.